From dozens of amazing entries, our FIGMENT Team chose four interactive sculptures we think take interactive sculptures to the next level. 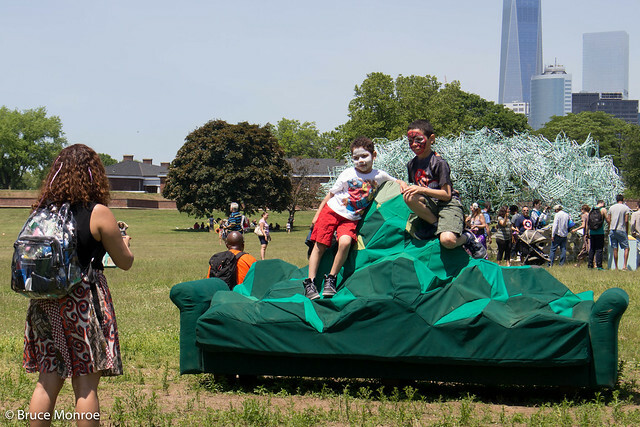 See below for an overview of our 2015 Sculpture Program—4 wickedly creative sculptures installed on Governors Island's Parade Ground by June 6-September 25, 2015. Mt. Marcy Couch aims to have viewers think about their relationship to their environment. People today are living within a digital world, more than ever diminishing the interaction they have with the natural environment. By bringing Mt. 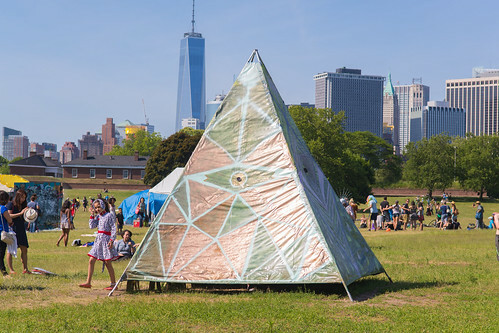 Marcy, the tallest mountain in New York State, to Governors Island, an exaggerated juxtaposition of environments is created. The connection between people and environment will be highlighted as the sculpture takes the form of an oversized couch with a geometric simplification of Mt. Marcy growing from its center. The form of the sculpture references the digital environment, our growing relationship to the living room and the loss of the natural landscape. Viewers can interact with Mt. Marcy Couch by sitting, laying and climbing on it as they enjoy a slice of the Adirondacks in the city. Hopefully, by interacting with the sculpture, people begin to question their relationship between our digital, interior and exterior environments as they are merged into a single piece of furniture. Today, a picnic is a casual meal that is eaten outdoors, but the word “picnic” was originally used to describe the collective contributions brought to a communal gathering—it was less about the setting. Common Picnic marries these definitions by taking an object that is a signifier for leisure in spacious, grassy areas, and adapting it to emulate the experience of living in a crowded city where we share our personal space with strangers all the time. It highlights how we have to have a basic respect for one another in order to prevent chaos on a daily basis. 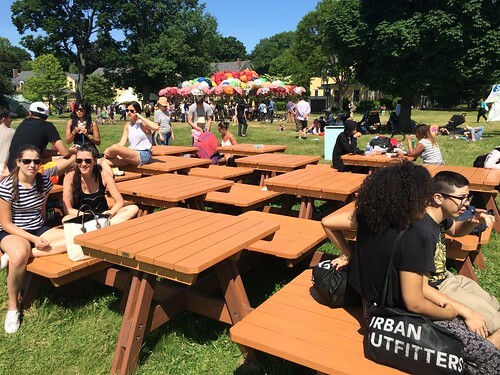 Common Picnic is a set of interconnected square picnic tables, arranged closely in an alternating, checkerboard-style grid, so that participants will have to choose whether to share benches, tables, or both. There will be just enough space between the tables and benches so that willing visitors can make their way to the inside of the structure. Common Picnic offers many levels of group and solitary interaction, including lounging, reading, socializing, playing, and, of course, picnicking. 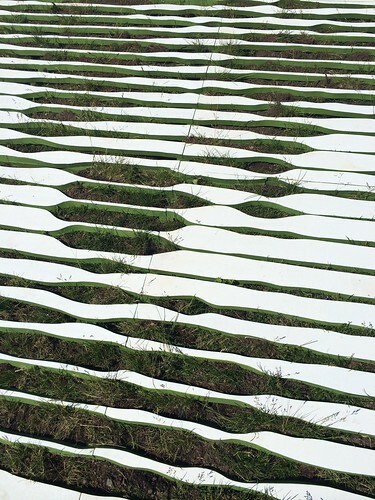 Fox combines the technologies of a sustainable “living wall” with public art in the context of the beautiful urban-infused nature of Governors Island in New York City. This installation is made with hand-cut white panels atop the greenery to create a portrayal of a fox—once native to the New York City area. The artwork interrupts the daily visual landscape by inviting the public to interact and study it in an artistic and contemplative manner; to discover the image and the natural scenery from different angles. The vectorized image may change by looking it from different angles, and seeing it too close the portrait would only give an abstract impression. Also built is an observation desk to provide a full sight from above. Fox illuminates the connections between art and architecture, between soft and hard landscapes, and between nature and all things man-made. By incorporating plant life and other materials found in the local natural environment, Fox dissolves the barriers between organic and inorganic elements of the urban landscape, and between nature and art. This pyramid structure, standing ca. 10 feet tall at its highest point, is both a sacred space and an optical art installation. Within the Eye of Providence is a camera obscura; the lens was salvaged from a former surveillance plane that once parked on Governors Island during its military history (estimated 1970s). Visitors will be able to turn the eye towards Wall Street, both as a symbolic and poetic gesture: the eye is one of the central symbols on American currency. Given the stark contrast between the light outside and the relative darkness inside the pyramid, it will also act as a sacred quiet space to observe and experience interiority within chaos. The eye used is from the Native American Eye of The Medicine Man that stands for wisdom and seeing into the future. The outer lines of the symbol represents the four corners of the Universe - North, South, East and West of the physical world. The inner lines represent the Spirit world, which the Medicine Man had knowledge of. The center circle represents the eye of the Medicine Man and his spiritual vision. Visitors are invited to explore the touristic, surveillance, and spiritual aspects of the eye. Alternatively you can turn the eye onto the island and allow visitors to pose in front of and interact with it! Please make a donation to FIGMENT to help us maintain these wonderful works of art this summer!